My family loves banana bread. I even have a favorite “go to” banana bread recipe. However, I bake it and we enjoy it at home. I don’t mail it. A very, very long time ago, my mother sent me a care package at college. It wasn’t a regular occurrence, so I was pretty excited. I’m not sure how long it took back then for a package to travel from South Carolina to St. Louis but I am guessing about 5 days, longer if a weekend was involved. When I opened the box, the contents left me puzzled. It wasn’t St. Patrick’s Day, but inside my care package was a green loaf cake. Unwrapping the loaf, I got a strong whiff of banana. Green banana bread? My mom was one of the original health nuts, so a cake made with green food coloring was out of character. You probably can guess where this is going. I only wish I had guessed before deciding to taste what turned out to be a moldy, slightly rancid banana bread. Moist, sugary cakes don’t travel distances well. A fruit or vegetable bread can spoil in 5 days sitting on an air conditioned kitchen counter. You give those little microbes a warm cozy spot, nestled in a box in the back of a UPS truck, and they will go to town. If it’s the winter where banana bread is mailed from and also winter where it is going, and the journey will take only a few days, it’s likely your fruity loaf will be fine. I choose not to risk it. However, just in case anything I send might unexpectedly spoil, my Monday Box recipient has been warned numerous times, that I won’t intentionally send him anything green. I seem to be making a habit of putting the flavors of favorite drinks and foods into cookie form. Last week is was chocolate espresso in a brownie cookie. This week it’s banana bread in a cookie. Banana bread cookies that will travel well! 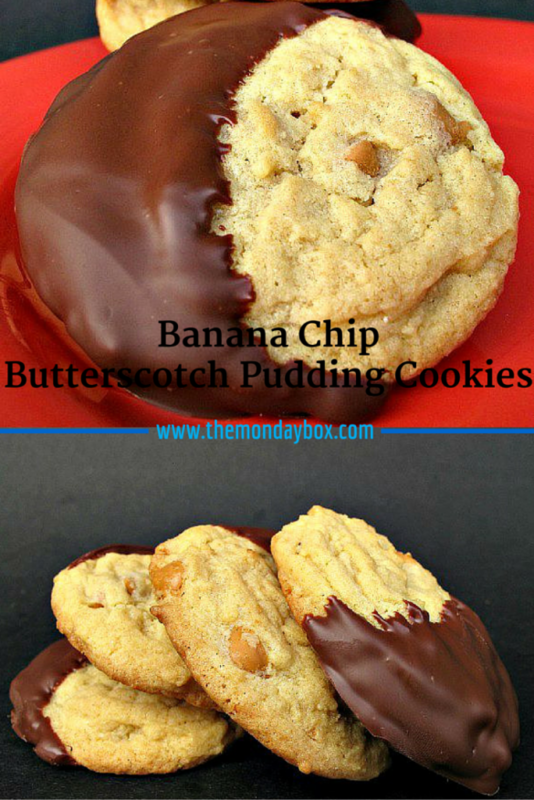 I am really excited about this soft, chewy Banana Chip Butterscotch Pudding Cookie. There are so many times that my baking imaginings don’t work out. This time the results met my expectations and then some. 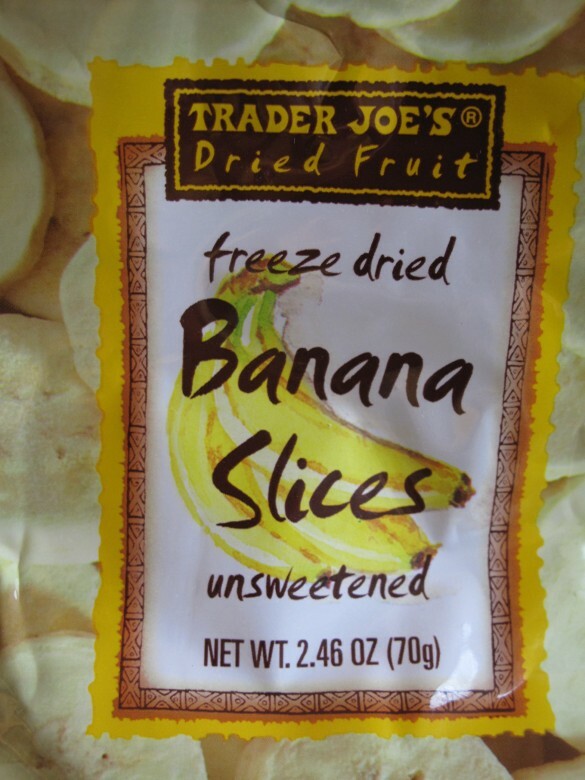 My not-so-secret ingredient is freeze dried banana slices. I bought mine at Trader Joe’s, but I have seen freeze dried fruit in the produce section of my supermarket and at Whole Foods. Don’t confuse freeze dried with plain dried fruit. Think astronaut food. 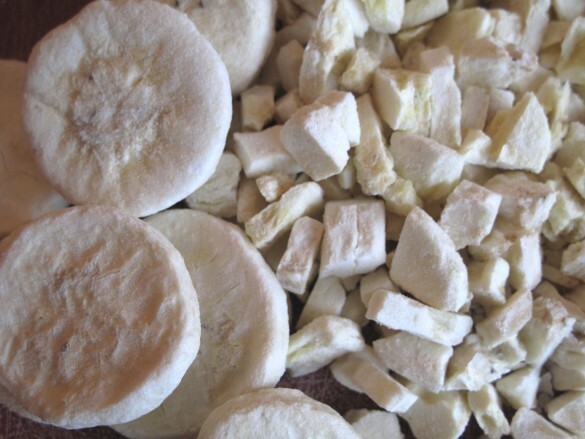 Freeze drying involves frozen food being placed in a refrigerated vacuum which extracts the water content. Freeze dried bananas are very light and crunchy, even crumbly. I easily chopped up the slices into chunks and added them to cookie dough flavored with banana cream instant pudding. The bigger banana chunks give a slight crunch. The little pieces sort of melted into the cookie. Butterscotch chips compliment the banana. 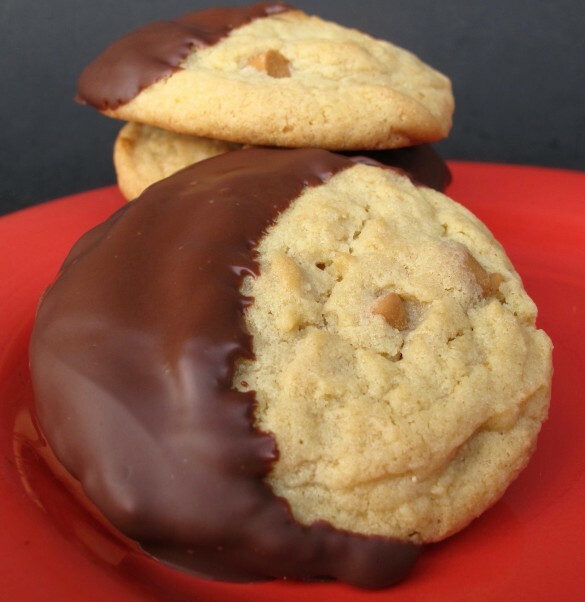 The butterscotch isn’t a strong separate flavor but somehow gives the cookies a baked sugar banana bread flavor. It’s hard to describe. You will just have to try them. Dipping the cookies in melted chocolate was the icing on the cake, or cookies in this case. Skip the chocolate coating if you are mailing these to or from a warm location. If the thought of leaving out chocolate makes you sad, toss ½ cup of semi-sweet chips into the batter. Baked in chocolate chips don’t melt into a mess like chocolate coating can. In a medium bowl whisk together the flour, baking soda, and salt. Set aside. In a large bowl, use an electric mixer to cream butter and sugars. Add eggs, pudding mix, and vanilla. Beat until fluffy. Stir in chopped freeze dried banana and butterscotch chips. Scoop heaping tablespoons of dough onto cookie sheet about 2” apart. Bake for 10-12 minutes, until slightly golden around edges. 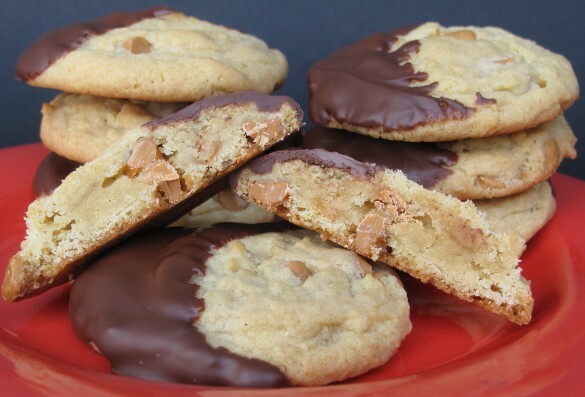 Optional: When completely cool, dip cookies in melted chocolate. 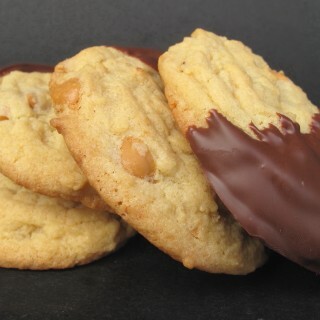 Place dipped cookie on wax paper until chocolate firms up. Store in an airtight container at room temperature for up to 5-7 days. 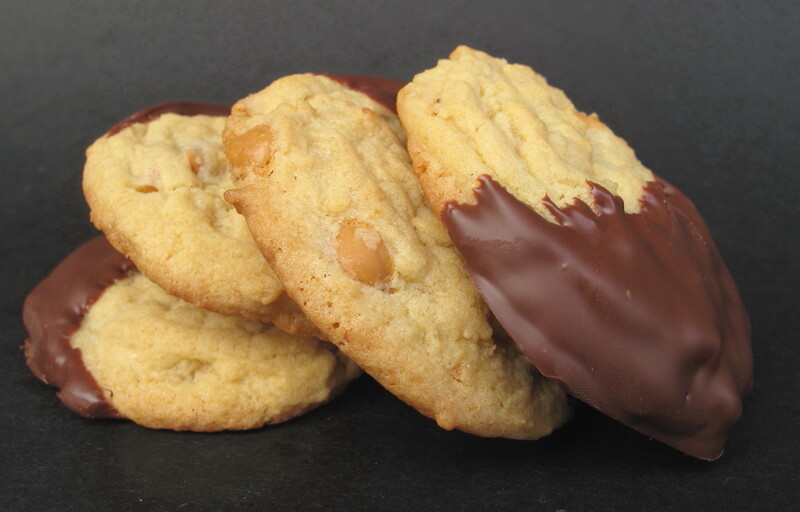 If cookies are chocolate dipped, separate layers of stored cookies with wax paper. Double wrap pairs of cookies in plastic wrap, with bottoms together. Package in air tight container or zip lock bag. when it comes to mailing banana anything 🙂 The freeze dried bananas are magic. These look insanely delicious! Love banana flavored anything! Dipping them in chocolate makes them extra special. So sorry about the green bread. Eww. These look pretty amazing! Love the chocolate banana combination. Love your blog too! Thank you so much, Tricia! I am enjoying your blog as well! 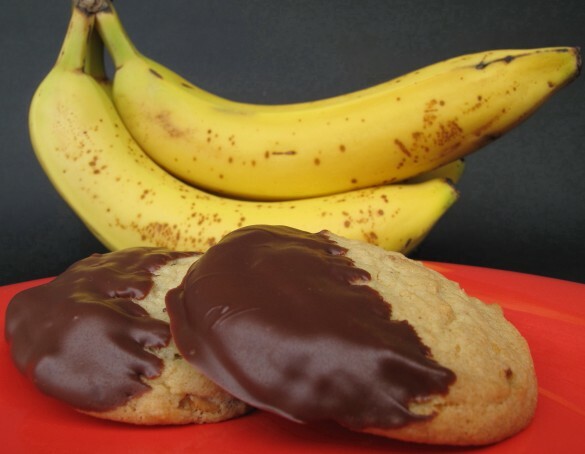 I love me some bananas, especially in a chewy cookie…Yummo! 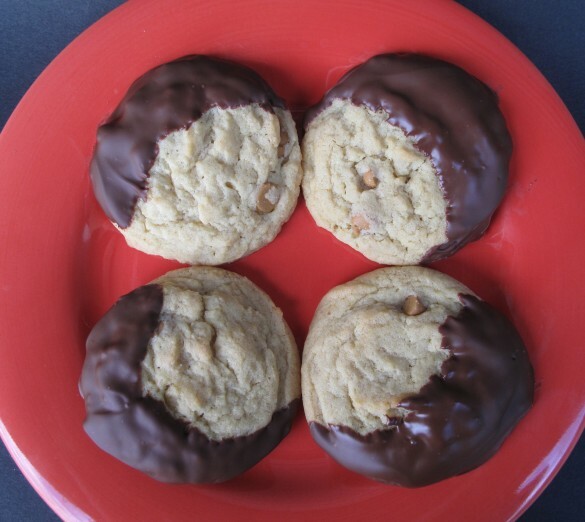 These look wonderful–and I love your advice about green baked goods! I haven’t tried to bake with the banana chips, but now I will. Thanks, Angela! I had never tried baking with freeze dried fruit before this recipe and now I am hooked! I hope you will be too. Oh No! That was an awful experience with Banana Bread! I am so glad that it did not keep you from baking and making these litlle Beauties! I have pinned this and am going to make them for sure! Thanks, Chandra! That banana bread experience just made me very aware that NOT every recipe is care package friendly 🙂 I hope you love these. Wendy this receipe sounds perfectly delicious! I am going to bake them for my Hump Day (Wednesday) snack that my husband takes to work. They will love them. And the great part is i don’t have to run from store to store trying to find over ripe bananas. I don’t normally eat my snacks as I try to send as many as I can to work with him. I just may have to snag a couple for myself this time! Question for you Wendy…when you say 1 cup of banana chips are you saying to measure the chopped up chips by what fits in a actual measuring 1-cup or are you saying use 8 oz actually? Hi, Sue. The recipe calls for one measuring cup filled with coarsely chopped freeze dried banana pieces. So pour out some freeze dried banana slices and chop them up a bit until you have enough to fill a 1 cup measuring cup. It’s not exact, but a few slices more or less won’t effect the cookies. I hope that answers your question and makes the instructions more understandable! Happy baking! I hope these turn out great for your husband and his coworkers!